Bronze Turkeys, also known as Cambridge Bronze Turkeys, are domestic turkey whose plumage has an iridescent bronze-like sheen. 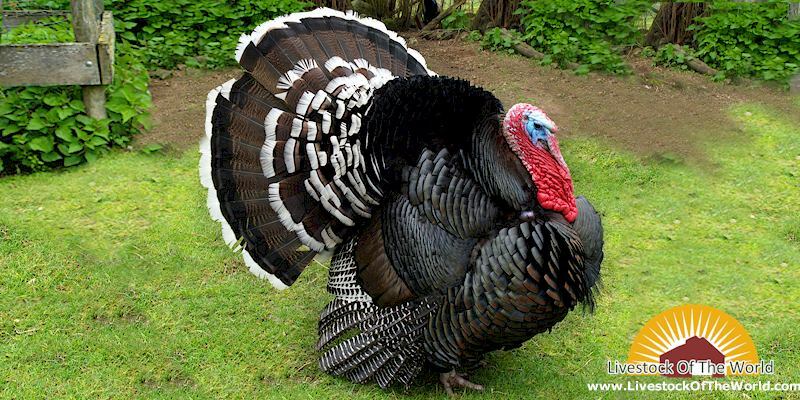 Bronze turkeys were developed by crossing domestic turkeys brought from England, with wild turkeys. These matings produced a bird that was larger and more robust than the European turkeys, and tamer than wild turkeys. Although Bronze turkeys were created in the 18th century, the actual name was not used until the 1830s, when a strain developed in the U.S. was named the Point Judith Bronze. The name later spread to be used in reference to the breed as a whole, and was in the process simplified to just "Bronze". In the Britain, the Bronze was associated with Cambridge, and was called the Cambridge Bronze, but again this name has been simplified to just "Bronze". Bronze Turkeys were first admitted into the American Poultry Association's Standard of Perfection in 1874. Later, beginning in the late 19th and early 20th centuries, some Bronze turkeys were selected for larger size. These much bigger birds became known as the Broad Breasted Bronze, to differentiate them from the original type of bird which was bred to the breeds' Standard of Perfection, and so was called the Standard (or Unimproved) Bronze. The plumage of the Standard Bronze is usually lighter and more lustrous than that of the Broad Breasted. Both have a brown color which is highlighted by shades of copper and blue-green, and the plumage overall is very similar to that of the wild turkey. Broad Breasted Bronze Turkeys dominated the commercial turkey industry for twenty years after its development, until the Broad Breasted White became the breed of choice. Due to their size, they have lost the ability to mate naturally, and Broad Breasted Bronzes in existence today are maintained entirely by artificial insemination. Standard Bronze Turkeys, however, have retained the ability to reproduce naturally and are considered to be a variety of heritage turkey. Today, both Standard and Broad Breasted Bronze Turkeys are listed on the ALBC's conservation priority list. The Standard is listed as "Critical", but the exact numbers of Broad Breasted are currently unclear. Standard Bronzes have additionally been included in Slow Food USA's Ark of Taste, a catalog of heritage foods in danger of extinction.